Pillow Talk - Create one-of-a-kind cushions using a variety of techniques from fabric manipulation and inspired embellishments, to a clever mix of materials, patterns and textures, for the perfect modern home accessory. All Dressed Up - Celebrate Spring with simply beautiful dresses featuring clean lines, easy shaping, and modern design details. Stitch It Up! - Get creative with needle and thread by using hand embroidery, top stitching and free machine embroidery to add interesting design details to your sewing projects. Flower Power - Get inspired by this season's floral prints and mix and match them in clever ways for fun projects to sew. 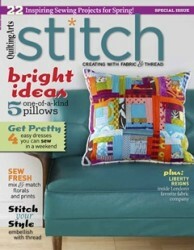 Material World - fabric reviews, profiles of fabric designers, trends in colors, fabrics, fashion, home décor & fibre art.